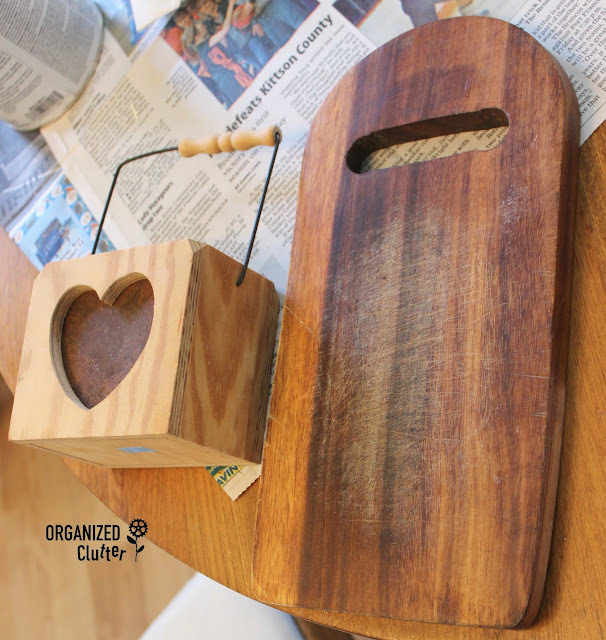 My Valentine's Day project started out with the purchase of this little wooden box with heart cutout and a cutting board. 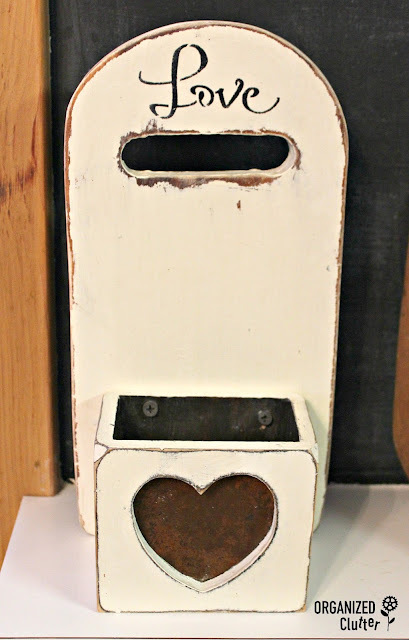 The box has a rusty metal insert behind the heart cutout. I removed the handle on the box and taped around the edges of the heart prior to painting. 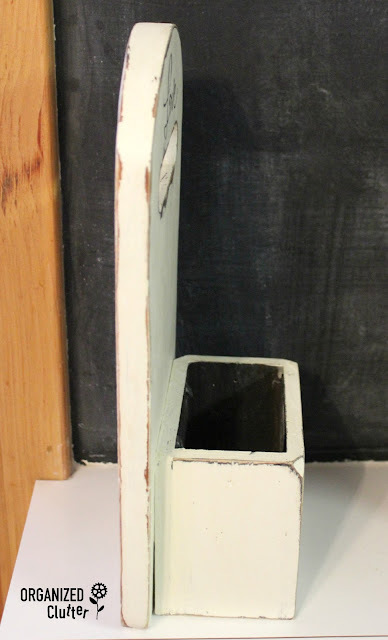 I painted both pieces with Annie Sloan Chalk Paint in Old White. I distressed both pieces with 100 grit sandpaper and then screwed the box to the cutting board. 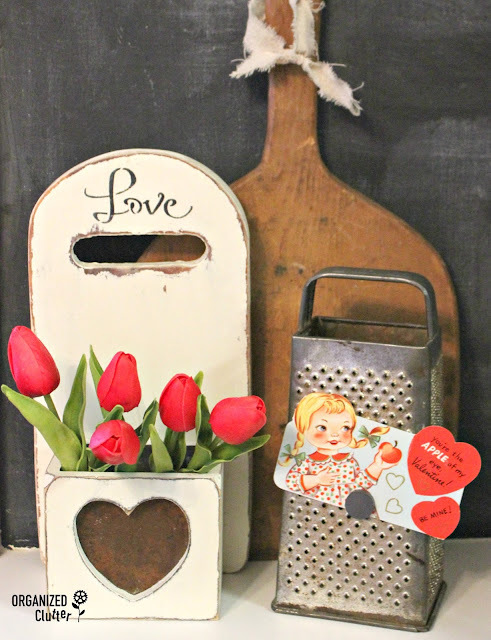 I also stenciled the word love above the handle cutout with the Inspiration Stencil from Home Depot. I usually don't care for heart cutouts much but for a Valentine's Day Project I made an exception. I sealed the pieces with Varathane Water Based Matte Poly. The little display box works well for red faux tulips or maybe even filled with heart shaped red lollipops on the counter. very cute idea. I'm usually not real crazy about heart stuff either, but I like this. You are a pro at thinking outside the box!! Love this idea, and it turned out so nice! 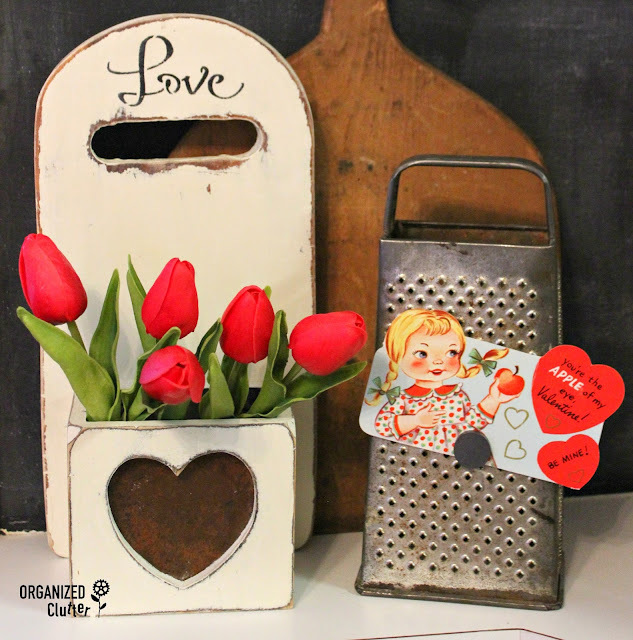 What a sweet idea...you are right...hearts are perfect for valentine projects! Really cute! I want to get out my hearts today! Ok, I'm not even a valentine decorator but that is just darn cute. You amaze me with your eye for seeing the possibilities in just about everything. Kudos for a great job! Cute arrangement! Very imaginative! I go to thrift stores, but don't always see the potential in random items. Nice Job. That is so cute!! I pinned! Aww, that is SUCH a cute idea! I love how you did it. It looks great with the tulips in it.